Most people these days have a plethora of friends or acquaintances with braces, but clear aligner therapy has only recently gained in popularity. Here's what you need to know about what separates traditional braces from Invisalign. For starters: Invisalign is the most well known brand of clear aligner because of the length of time it as available on the marked, the ease of their online system to navigate treatment options and their widespread marketing. It has a reputation for it's reliability and therefore is the one we use at Sugar Land Braces, but it is not the only brand of aligners out there. Invisalign is a system of straightening teeth using a series of nearly invisible, removable, and surprisingly comfortable trays that are custom made to fit you based on a digital scan. Once the scan Dr. Gee submits it to Invisalign so that their system will analyze and predict the number of trays it will take to correct your smile. From this point Dr. Gee can review their treatment plan and make any necessary revisions to it. He will also have a virtual treatment plan that you can view which will show how your teeth will move with each new tray. The aligners are invisible and removable, so you do now have to change what you eat while in treatment. Brushing and flossing is also going to be easier because you wont be trying to brush underneath wires, or around brackets in the center of your teeth. The amount of time you come in for appointments is very minimal with visits approximately every 6 weeks to pick up new trays and get any new attachments which may be needed. You wear each aligner for about 2 weeks, removing them only to eat, brush teeth, and floss. In other words, the goal is to wear them at least 22 hours a day. 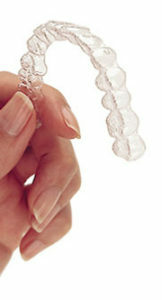 With each new aligner your teeth will move little by little until your teeth have straightened to their final position. The 6 week visits will check to make sure everything is going as planned.